The Egyptian Army will soon take delivery of its first ST-100 mine-resistant, ambush-protected (MRAP) armoured vehicles from Egypt’s IMUT. According to Egyptian reports, the Deputy Chairman of Egyptian Military Factory No.200 recently said in a television interview that the ST-100 and ST-500 armoured vehicles will soon enter Egyptian Army service. The ST-100 and ST-500 were showcased for the first time at the inaugural Egypt Defence Exhibition (Edex) in Cairo last month. The vehicles are built by International Marathon United Technology Group (IMUT). They were developed in South Africa in 2016 by SASKA, which was owned by an Egyptian businessman. The company was moved to Egypt in 2018 and rebranded as IMUT in partnership with the Egyptian military. In December, IMUT President Michel Knight told Jane’s Defence Weekly that the Egyptian Armed Forces has shown serious interest in the ST-100 and had requested modifications before ordering it. 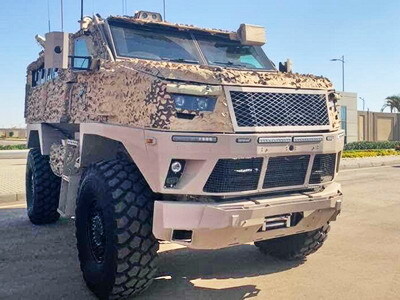 Reham Fahmi, IMUT vice-president for strategic alliances, said the MRAP has already passed extensive protection tests carried out by the Egyptian Armed Forces, Jane’s reported. The 4×4 ST-100 has a curb weight of 14 500 kg and payload of 3 500 kg. It is available in many different variants, including command and control, ambulance, patrol, 81 mm mortar, anti-tank (with six missiles), explosive ordnance disposal, communications and 107 mm rocket launcher. Optional extras include a soft kill active protection system, sniper detection system, battle management system and remote weapon station. Standard seating for the ST-100 is driver, commander and three crewmembers in the patrol version and eight in the attack and intervention version. The vehicle has a double cab pickup layout, with four side doors and a rear door, although it does come with two side doors as well in the armoured personnel carrier version. Power plant is a Cummins ILS 8.9 litre diesel engine developing 450 hp and giving a top speed of 100-115 km/h and range of 700 km. Additional armour can be fitted to give ballistic protection up to Stanag Level 4 (14.5 mm projectiles). Blast protection provides for 10 kg of TNT under the hull, 10 kg under a wheel and 50 kg at a side distance of 50 metres. The 4×4 ST-500 has armour protection up to CEN Level SR6/SR7 and is available in several variants, including ambulance and fire support. According to Army Recognition, the ST-500 is 5.65 metres long, is 2.4 metres wide and 3.15 metres high. It weighs 8 000 kg and can carry 2 500 kg of payload. Standard configuration provides accommodation for a driver, commander and five passengers. The ambulance version can carry three crew and two stretcher patients. Optional extras include rocket launchers, mortars remotely controlled weapon stations, smoke grenade launchers and cameras. Power plant on the ST-500 is a Cummins QSB 6.7 litre diesel developing 275 hp and giving a top speed of 120-135 km/h. According to IMUT, the company specialises in the design and integration of vehicle systems and is based in New Cairo, Egypt, but falls under a South African parent company. It will expand into the civil sector with heavy duty loaders and cranes, amongst others. It expects to soon begin manufacturing new armoured vehicle types in Egypt.